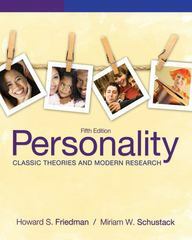 Personality 5 Edition This successful text puts “personality” back into the personality course, integrating the classic insights of the personality theorists with modern research in a manner that will fascinate and encourage deeper thought. This text explores classic theory from a perspective that encourages critical thinking and fosters intellectual insight with respect to human nature. For example, it shows the relevance of classic theory to topics of personality and culture, evolution, ego, gender, and person-situation interactionism. Employing the highest scientific standards, Personality also uses a wide range of unique and provocative pedagogical devices that have been shown to motivate students. Hailed as the best-written, most relevant personality textbook on the market, Friedman and Schustack's fourth edition brings the field of personality to today's diverse student body.